Whether you need a flour replacement due to an unexpected shortage or for health reasons such as an allergy to wheat or gluten, there are many alternative ingredients to use in place of wheat flour for your favorite recipe. There are a variety of pre-mixed products and over a dozen alternative flours to mix, match and try. If you run out of all purpose flour and happen to have a bag or box of Bisquick lying around, consider giving it a try. 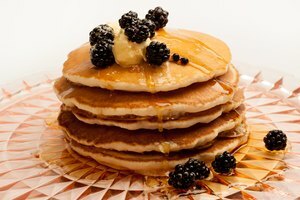 Bisquick is made out of a combination of all purpose flour, shortening, baking powder and salt. Because every recipe varies in necessary ingredients and amounts, it is a gamble to use the Bisquick since you don't have any control over the level of baking powder or soda. When using Bisquick instead of flour, do not add any extra baking soda, salt or baking powder even if your recipe calls for them. Use unsalted butter as well. Many gluten-free flour commercial producers market a specific type of flour known as a gluten-free baking mix. The mix is 100 percent gluten free and is used by those who are allergic to wheat gluten, have Celiac disease or follow a reduced gluten diet. Most of these mixes can be instead of flour in the same measurements and without having to add extra ingredients. 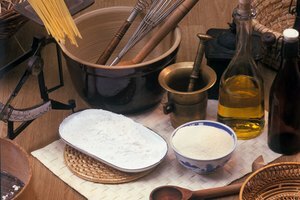 All ingredients needed to recreate the properties of wheat flour are already included in the mix. Brands that offer gluten-free baking mixes include Bob's Red Mill, Betty Crocker, Blue Ribbon Flour Company, Arrowhead Mills, Gluten Free Pantry and Pamela's. Like gluten-free baking mixes, there are many alternative flours that can be used instead of wheat flour. These include tapioca flour, corn flour, sorghum, quinoa, rice flour, arrowroot, amaranth, buckwheat, chickpea (garbanzo) flour, almond flour, potato flour, teff and soy flour. 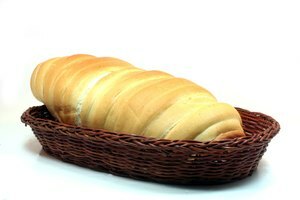 All flours can be used in baking, though they each have their own flavors, textures and effect on the chemical reaction during the baking process. 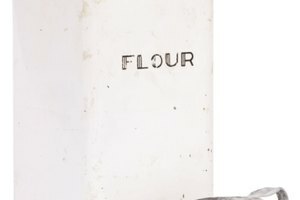 If using alternative flours, it is best to mix two, three or even four flours together to create a more flour-like consistency and add binding gums or gelatin. 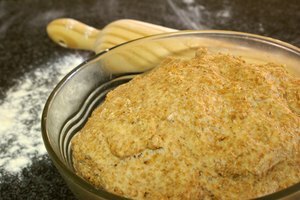 If replacing wheat flour in a recipe with alternative flours, a substance that acts like gluten is necessary to bind the flour together and allow it to rise. Products such as xanthan gum, guar gum and gelatin can help bind the flour together as a gluten replacement. If a replacement is not used, the item being baked will likely turn out crumbly.